Here are some facts about Greenwich Palace. Greenwich Palace was built during the 15th century by Humphrey, the Duke of Gloucester. It was located on the south bank of the River Thames in Greenwich, about 15 km along the river from Westminster. It was conveniently located close to the royal dockyards at Deptford and Woolwich. The dockyards were used for building ships and for repairs until they closed in 1869. It was originally known as the Palace of Placentia. After Humphrey’s death in 1447, King Henry VII moved in and made improvements which included adding three large courtyards. Greenwich Palace was one of the most modern and luxurious buildings of its time. It boasted fine furniture and paintings, as well as tennis courts, an armory, kennels and stables. Henry VIII added gardens, orchards and a large fountain. He also built a special area outdoors where knights could take part in jousting events and competitions. Several English kings and queens were born there during the next 200 years, including Henry VIII, Mary I and Elizabeth I.
Henry VIII married Anne of Cleves in the palace. Elizabeth played as a child in an oak tree in Greenwich Park. The huge tree fell over during a storm in 1991 but can still be seen lying on its side. Oliver Cromwell took over the palace during the English Civil War of 1642 to 1651. He used the building as a biscuit factory and a prison, after unsuccessfully trying to sell it. 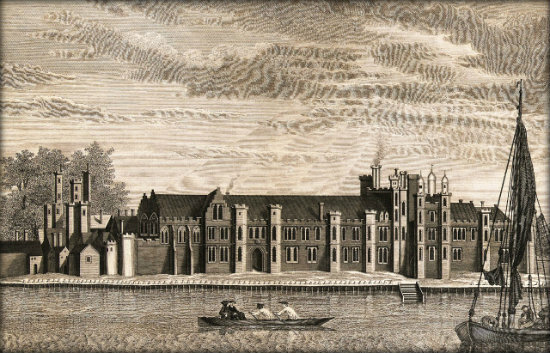 Much of the building was demolished in the 1660s to make way for Charles II’s new palace. This later became the Royal Naval College, and today is part of the University of Greenwich. The Queens House is the only part of the original Greenwich Palace still standing. It was designed by the architect Inigo Jones and was the first classical designed building in Britain.